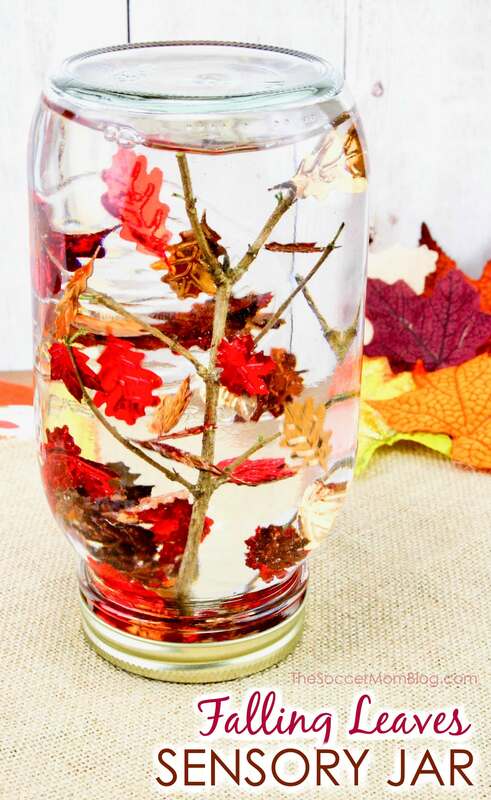 This Falling Leaves Sensory Bottle is a cute and easy Fall kids craft or decor idea! Who says snow globes are just for winter? Actually, I wasn’t sure what to call this project at first – which is essentially a snow globe, but with falling leaves instead of snow. 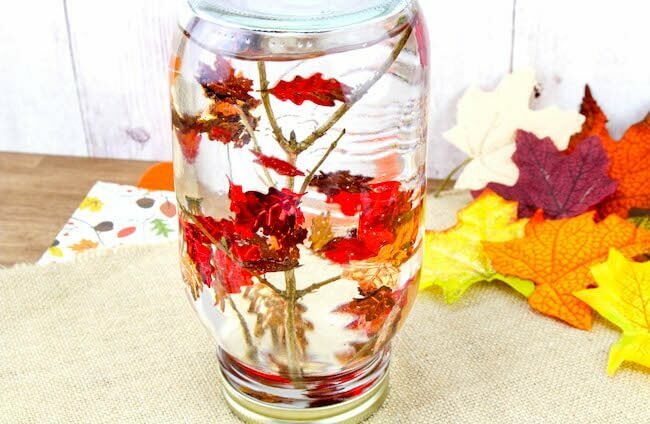 You can use it as a Fall Sensory Bottle (if making for little kids you may choose to use a plastic container for safety purposes). You can also use it as a cute seasonal decoration, a Fall Snow Globe. 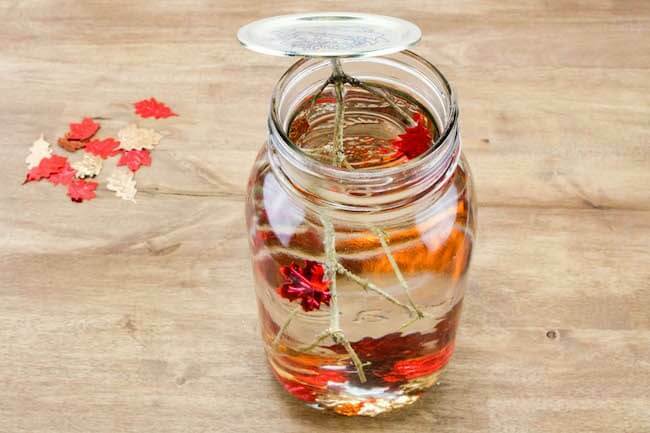 No matter what you use it for or what you call it, this falling leaves jar is super cute! 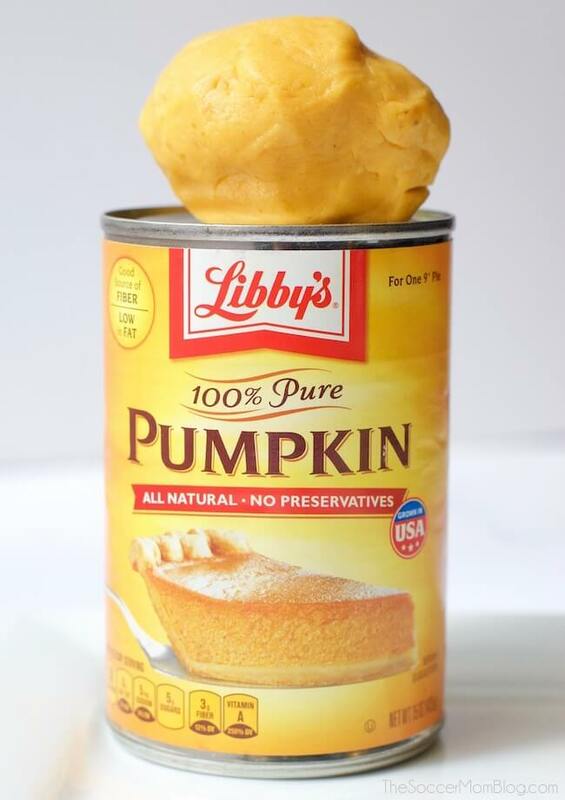 And it’s super easy to make! Related: Be sure to check out our Painted Mason Jar Pumpkins to make for fall too! 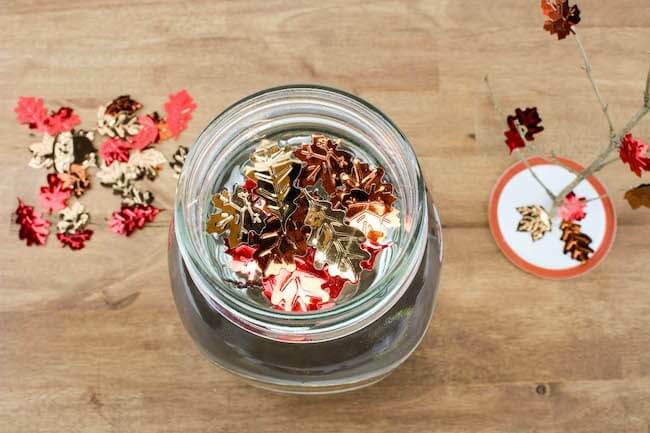 Watch this quick 1-minute tutorial to make our Fall Leaves Snow Globe, then keep reading for full supply list and photo step-by-step directions so you can easily make it too! Related: Click here to see how we made our DIY Christmas Snow Globe! I have to admit, there is something so soothing about watching a sensory bottle in action — like these shiny foil leaves swirling. They’re relaxing! 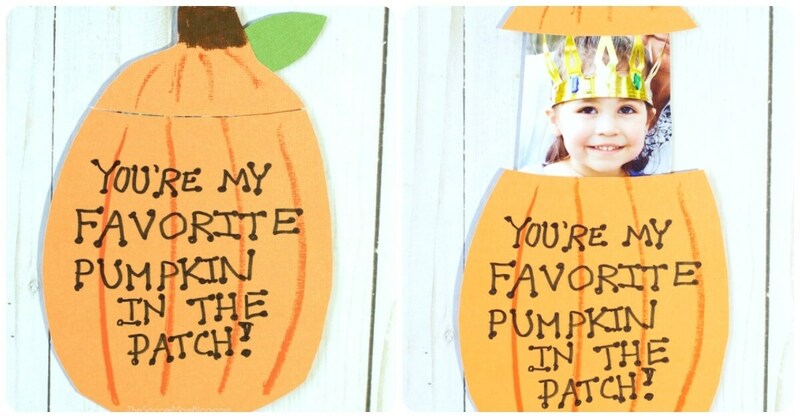 The best part is that anyone can make them with only basic crafting supplies! 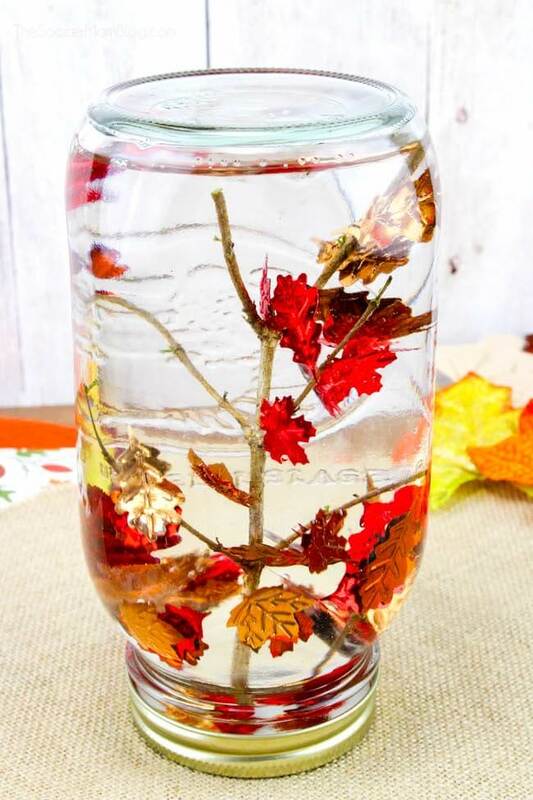 For your convenience in re-creating this Falling Leaves Sensory Bottle, I’ve included shop-able ad links to some of the products used; full disclosure policy available here. Collect a small tree branch from your yard. Make sure it’s clean, without peeling pieces of bark that might cloud up your bottle. Trim the tree branch to fit inside your mason jar. Test to make sure that it fits (with the lid closed) before attaching with glue. Once you have the size you need then add a generous drop of hot glue on the middle of the bottom side of your mason jar lid. 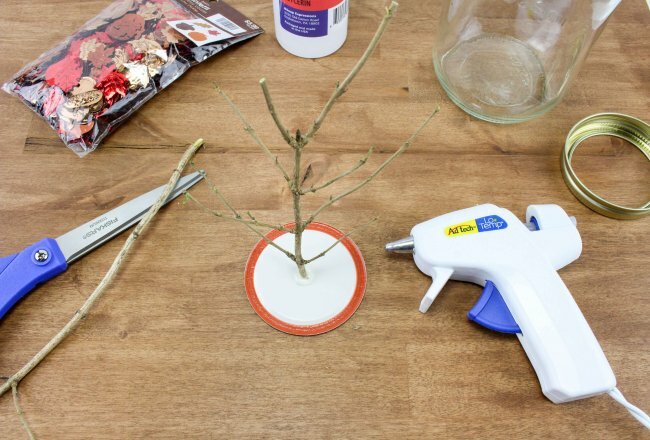 Stand your tree branch in the middle of the glue and hold until it is set. 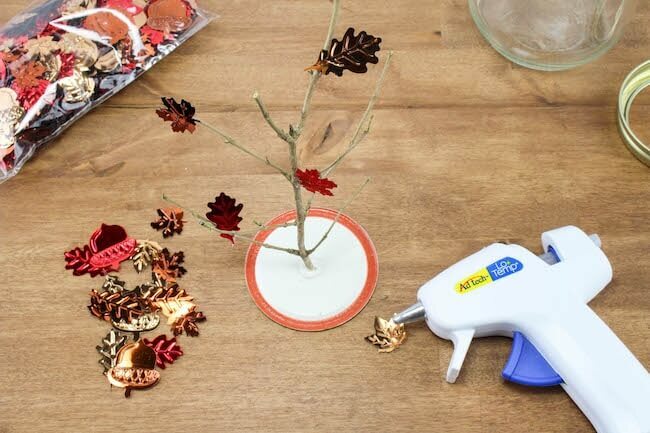 Glue a few leaves to the tree branches and allow to set until all the glue is completely dry. 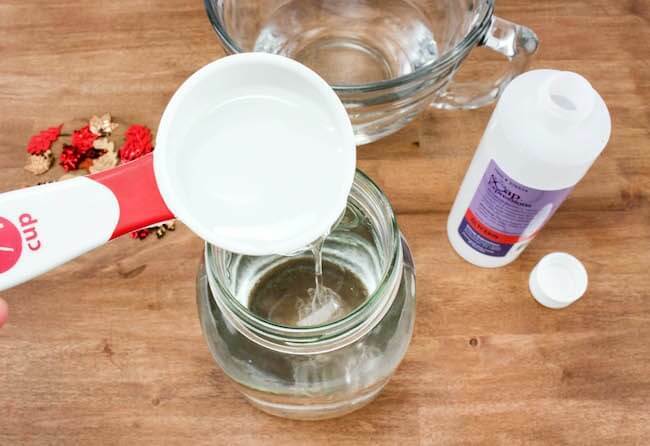 Fill mason jar with water (if using a quart jar this will be about 4 cups), then add the glycerin (I used a little over ½ cup). Mix with a spoon then add a bunch of the confetti to the jar. Swirl around with a spoon and if the confetti immediately sinks to the bottom then add a bit more glycerin. The glycerin is what makes the leaves fall slowly. Place the tree branch carefully down into the water and twist the lid on very tight. TIP: If you’re sure that you’ve got your Falling Leaves Snow Globe just right, you can glue the lid shut to prevent leaks. Have fun watching the leaves fall! 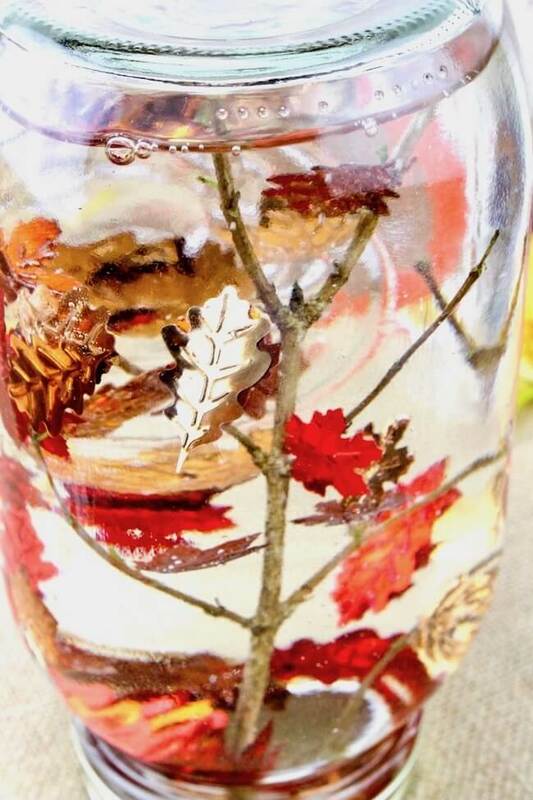 Be sure to pin our Autumn Leaves Sensory Bottle on Pinterest! Looks like lots of fun! Where did you find the glycerin? Hi Ashley – there is a link to glycerine on Amazon in the supply list. It should also be available in most craft stores. Hope this helps!